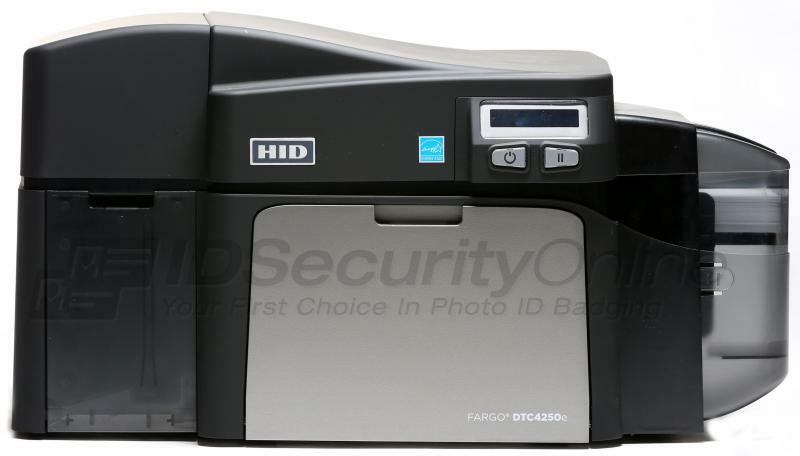 The Fargo DTC4250e Dual-Sided ID Card Printer with Ethernet (item#52000) is a modular and durable solution to print secure ID cards and badges on demand. 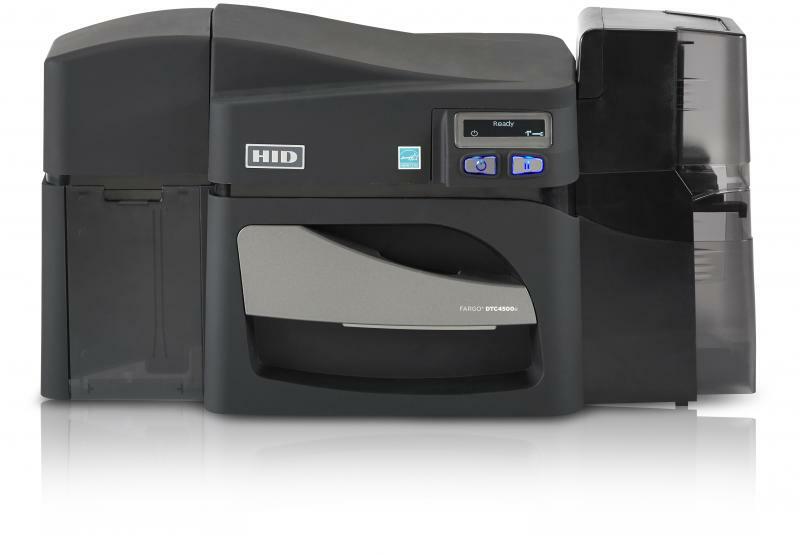 The Fargo DTC 4250e Dual-Sided ID Card Printer is a direct-to-card printer that offers stunning edge-to-edge credentials. Whether you need vivid colors or sharp monochrome printing, your Fargo printer delivers. 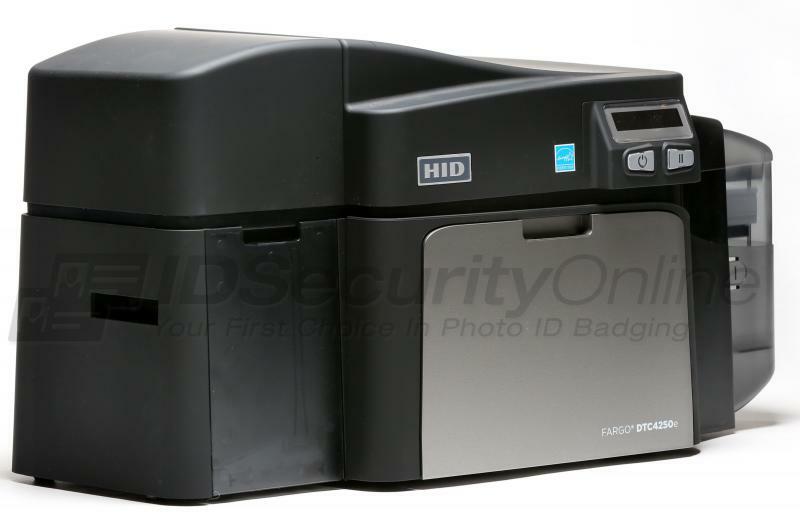 The Fargo DTC 4250e Dual-Sided ID Card Printer is very easy to set up so get ready to start printing professional badges within minutes! The printer comes with Built-in Swift ID� badging application to help you create ID badges in seconds without having to install any additional software. Choose from easy (EZ), all-in-one print ribbon and card cleaner or economical and eco-friendly (ECO) refill ribbons. A card cleaning roller is integrated into the ribbon cartridge for easy maintenance. Maximize productivity and minimize wait time for cards and IDs with this fast card printer. The DTC 4250e prints full color cards at a rate of 16 seconds per card (YMCKO), 24 seconds per card (YMCKOK) and monochrome badges at a rate of 6 seconds per card (K). 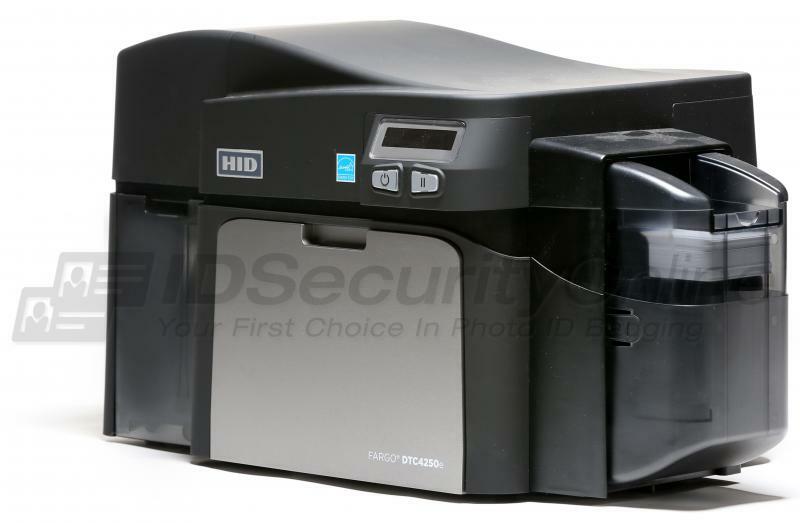 Standard printer password protection and fluorescent panel printing provide a cost-effective and dynamic means of increasing card security. The optional iCLASS SE� encoder can be fully integrated into your printer, allowing you to create, encode (read/write) and manage your secure credentials from start-to-finish. Design personalized ID badges locally and then program them to work with your current physical access control system (PACS), streamlining your ordering, inventory management, and issuance processes. The Fargo DTC4250e comes with drivers for all operating systems, including Windows� 7, Windows� 8 (32 bit & 64 bit), MAC OS X 10.5/10.6/10.7/10.8 and Linux. The Fargo DTC4250e ID card printer features a 3-year warranty on printer and printhead. The Fargo DTC4250e Dual Sided ID Card Printer 100 Card Input Hopper features a 3-year warranty on printer and printhead.